Today, the venture-funded Better Place consortium released a video showing one component of their project: a two-minute automated swap of the battery pack in an electric car, in this case a Nissan Rogue. It's a nice video, and it's all over the interwebs. Green-car sites, tech geeks, EV fans, everyone's posting about Better Place. We just felt we should add a few words of perspective and some background on the notion of "hot-swapping" battery packs. We've talked to several auto engineers over the years. To a man, they are highly, highly skeptical that Better Place and its auto partner (Renault) can design and engineer a car that allows the pack to be removed and replaced in such a short time. Why is hot-swapping so challenging? First, the pack must be a core element of the vehicle's platform that contributes basic rigidity. The "T-Pack" battery of the 2011 Chevrolet Volt, for example, provides much of the strength down the vehicle's spine, where a transmission tunnel would be. That pack appears to be bolted to the frame in dozens of places. Removing and replacing a 500-pound battery pack in two minutes might be roughly similar to removing and replacing a car's roof and doors in the same amount of time. Or perhaps doing the same with its engine and transmission, though those have far more wires, hoses, and connectors than the pack does. Second, the vehicle has to last 10 or more years, which could mean as many as 1,000 swaps for a high-mileage vehicle. That requires engineering new types of mountings, fasteners, seals, and connectors that have never been built. The engineers we spoke to questioned whether it was possible to design a safe, high-voltage connector durable to be inserted and removed that often. Keep in mind that any auto component must withstand the pounding, vibrations, dirt, mud, water, and general abuse ladled out to a car's chassis and structure over hundreds of thousands of miles and up to 20 years. Third, the video appears to show the pack dropping out of the bottom of a small crossover vehicle. Such a pack is likely to be 6 inches thick or more, even accounting for the laminated cells used by Automotive Energy Supply Corp., the lithium-cell company controlled by the Nissan-Renault alliance. That's not a deal-breaker, but it imposes significant design constraints. 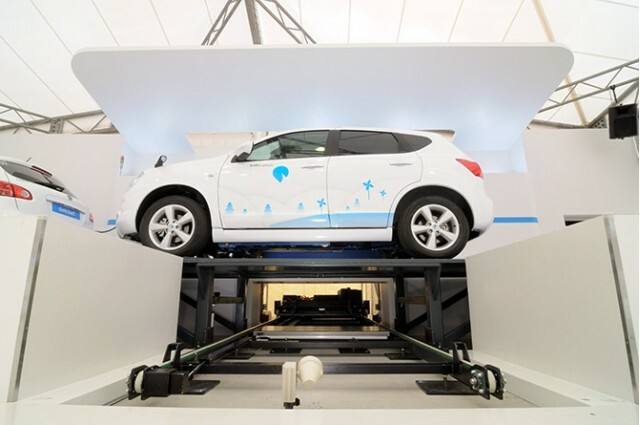 The car is likely to be quite tall, to accommodate not only the occupants and the thickness of the battery pack, but a false floor on top of the battery to keep the car rigid even with the pack gone. Finally, Better Place has spoken often of its desire to standardize packs to give consumers a choice of vehicles. Right now, Renault is the only company designing cars with removable packs. Frankly, that ain't gonna happen. Every automaker considers its pack technology to be a core competence, similar to engine design. Given how tightly packs are integrated into vehicle design, few makers are going to use a pack designed by someone else. Lithium cells, yes, but not the packs and control electronics that make hundreds of cells work together. BP will likely launch in Israel with only a single vehicle available. We suspect that not every Israeli will want to drive an identical car, let alone actually needing different vehicle types for different uses. And remember, one-car families are much more the norm in Europe and Asia, so this car may be a family's only option. Please, don't get us wrong; we applaud innovation in the auto industry. And we do actually hope that Better Place gets its very, very ambitious program up and running. Frankly, the automotive world could use some paradigms shifted. We're just not ready to conclude, on the basis of one public-relations video, that Better Place is going to succeed at battery swaps. As they say, stay tuned for more.